Need to learn how to shim a door? The following door installation instructions are to be used when you install pre-hung doors. Here is a list of steps for door shimming. Included are some general tips for installing a door. Check the rough opening dimensions The rough opening height should be equal to the door height plus 2-1/2 inches. A standard door height is 80 inches. The rough opening width should be equal to the door width plus 2 inches. An example, a 30 inch wide door would need a 32 inch rough opening, when installing prehung doors. Remove any packaging on the door used for shipping. *Tip – place 1/2 inch blocks under the jambs if you will be installing carpet. 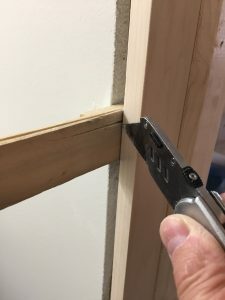 There are two ways to shim a door: Shimming a door in the jamb and removing the door from the jamb, and setting the frame first. Pros: Leaving the door in the jamb saves time because you need the door in the frame in order to square the jamb to the door..
Cons: It can be quite cumbersome (especially with heavy doors), often times this method requires two people. It is impossible to add shims from both sides of the door without a second person. Pros: The door frame is much easier to handle with the door intact. Cons: Often, this will be more time consuming as you’ll need to re-install the door to the hinges to square it with the jamb. In these instructions we will assume the door is left in the jamb. Place shims between the door frame and the wall by sliding them in from each side. Do this by each hinge. Nail through the face of the jamb with 2-1/2 inch finish nails under or into the shims to hold them in place. Use a 4 or 6 foot level to check for plumb. Check the head (top) jamb for square and level with the previously installed hinge side of the door jamb. Shim the middle and attach to the wall with 2-1/2 inch finish nails. Place shims between the wall and the door frame on the latch side of the door. Start at the top, keeping the reveal or clearances as equal as possible. *Tip – Make sure the door unit is flush with the edge of the drywall. 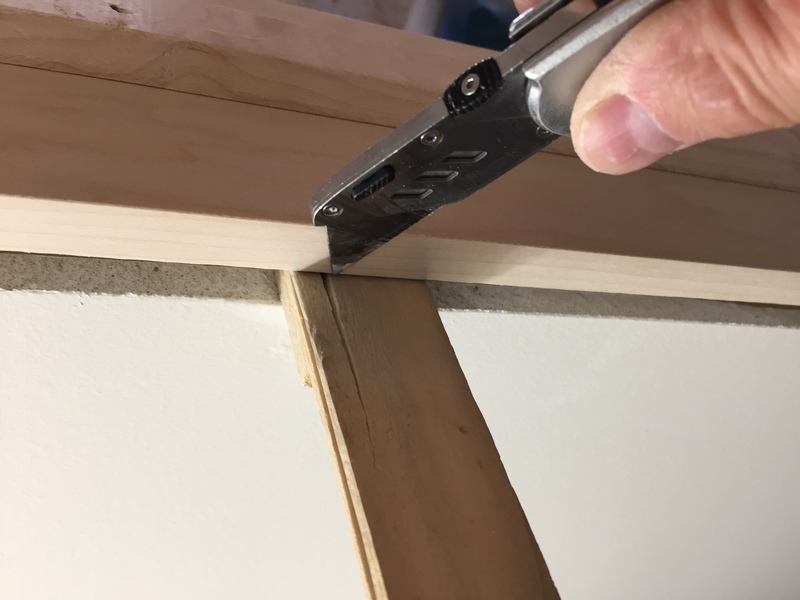 Trim off any excess shims protruding beyond the walls edge with a utility knife. Score both sides, this should allow them to snap off. Remove the center screw from the top hinge on the frame and replace it with a 2-1/2” long screw. This can be done on all hinges, but is most important on the top hinge to prevent heavy or solid core doors from sagging over time. Install trim. Make sure shims are not protruding beyond the edge of the drywall as this will cause your trim to not fit tightly against the wall. Lightly sand the door to remove any small scratches or smudging caused by handling and shipping. Stain, paint or clear coat following any manufacturer’s instructions. To prevent delamination or warping, apply finish to all 6 sides of the door. Want to try an easier and faster door installation method? Watch an interior door installation video now using the EZ-Hang Door Installation System. Hang your doors with door brackets instead of shims.